Stocks tumble as Investors were still agonizing over frozen credit markets. Wall Street capped its worst week ever with a wild session on Oct. 10 that saw the Dow Jones industrials rocket within a 1,000 point range before closing with a relatively mild loss and the Nasdaq composite index actually end with a modest advance. Investors were still agonizing over frozen credit markets, but seven days of massive losses made many stocks tempting for traders looking for bargains. The Dow lost 128 points, giving the blue chips an eight-day loss of just under 2,400. The average had its worst week on record in both point and percentage terms, as did the Standard & Poor's 500 index, the indicator most watched by market professionals. But there were signs Friday that some investors might believe the market was at or near a bottom. Just one day earlier, selling accelerated in the last hour of trading, giving the Dow a loss of 678 points, as many market players fled, while Friday, many people were clearly buying. And the Russell 2000 index, which tracks the movements of smaller company stocks, had a 4.66 percent gain Friday; small-cap stocks are often first on investors' shopping lists when they think a market turnaround is at hand. "Nobody wants to miss the bottom," said Anton Schutz, president of Mendon Capital Advisors in Rochester, N.Y., who said of the Dow's performance, "I view it as a victory that we only finished down 100." Some investors may have been placing bets ahead of the weekend meeting of officials from the Group of Seven nations, who gathered in Washington to discuss the economic meltdown. One of the potential remedies expected to be reviewed at the meeting is for governments to guarantee lending among banks. "Everyone is hoping for really good news that can invigorate some buying and break this credit freeze, but your guess is as good as mine as to whether that will happen. I think people are desperate for action," said Jon Biele, head of capital markets at Cowen & Co. "It truly is remarkable to watch what's happening." Still, Friday's widely mixed finish was proof that Wall Street remains deeply troubled, and trading was likely to remain volatile when the market reopens on Monday. The hair-trigger mentality of the market — a reflection of the intense anxiety on the Street — was evident from the opening bell. The Dow fell 696 points in the first 15 minutes, recovered to a gain of more than 100 before that first hour was over and then turned sharply lower again. It spent much of the session with a deficit between 300 points and 500 points, regaining some ground and then falling again — until the last hour, when the average had swings spanning hundreds of points that took the Dow up as much as 322. Investors have shuddered the past month over a credit market that remains frozen, posing a threat to the economy. But Friday's gainers included financial stocks, the ones most decimated amid the ongoing banking and credit crisis. The major indexes' sharp swings were likely exacerbated by the computer-driven "buy" and "sell" orders that kicked in when prices fell far enough to make some stocks look like attractive bets or make other investors want to exit the market. "Fear has been running rampant all over the Street. Fear and greed, that's what rules the Street. I think the carcass has been stripped to the bone," said Dave Henderson, a floor trader on the New York Stock Exchange for Raven Securities Corp. 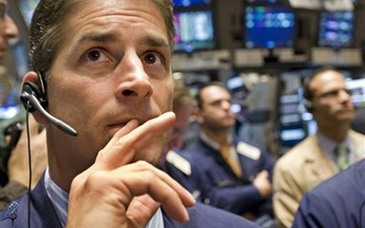 The Dow fell 128.00, or 1.49 percent, to 8,451.49. At its low point Friday, the Dow was down 696 at 7,882.51, just 60 points above its low in Wall Street's last bear market, 7,286.27, reached Oct. 9, 2002. It crossed the line between gains and losses 32 times during the session. The Dow rebounded from a low of 7,882.51 for the day — the worst trading level since March 17, 2003. Still, its close was the lowest since April 25, 2003. The Dow's stats again told how horrific the run has been on Wall Street: — The Dow has fallen for eight straight sessions — the longest losing streak since the eight days of declines following the Sept. 11, 2001, terror attacks, when the blue chips lost 1,038.12, or 10.8 percent. — The Dow has lost 1,874.19 points, or 18.2 percent, over the past week. Its dismal performance outdid the week that ended July 22, 1933, which saw a 17 percent drop — and back then, during the Great Depression, there were six trading days in a week. — It's been the worst run for the Dow since the nearly two-year bear market that ended in December 1974 when the Dow lost 45 percent. — Just a year ago, on Oct. 9, 2007, the Dow and the S&P hit their record highs. Since then, the Dow has lost 5,713 points, or 40.3 percent, since closing at 14,164.53. The S&P 500, meanwhile, is off 666 points, or 42.5 percent, from its peak of 1,565.15. Broader stock indicators were mixed Friday. The Standard & Poor's 500 index fell 10.70 or 1.18 percent, to 899.22, while the Nasdaq composite index rose 4.39, or 0.27 percent, to 1,649.51. The Russell 2000 rose 23.28, or 4.66 percent, to 522.48. Investors on Friday suffered a paper loss for the day of about $100 billion, as measured by the Dow Jones Wilshire 5000 index. Since the highs of Oct. 9, 2007, the losses have piled up to $8.4 trillion. Most major central banks around the world slashed interest rates this week after continuing problems in the credit market triggered concerns that banks will run out of money. Analysts have described the mood on trading floors this week as panicked at times, with investors bailing out of investments on fears there is no end in sight to the financial carnage. A stream of selling forced exchanges in Austria, Russia and Indonesia to suspend trading, and those that remained opened were hammered. The rout in Australian markets caused traders there to call it "Black Friday." European stocks sank Friday, with Britain's FTSE-100 falling 8.85 percent, German's DAX declining 7.01 percent, and France's CAC-40 ending down 7.73 percent. In Asia, the collapse of Japan's Yamato Life Insurance caused already nervous investors to pull even more money out of the market — the Nikkei 225 fell 9.6 percent. An index considered to be Wall Street's fear gauge reached record highs on Friday in another sign of massive investor anxiety. The Chicago Board Options Exchange Volatility Index, known as the VIX, rose to an all-time intraday high of 76.94 Friday. The VIX, which usually trades under 50, tracks options activity for the companies that make up the S&P 500. Still, prospects of further government help and, perhaps, attractive prices helped parts of the financial sector show signs of life. Big national banks were among the gainers, including Bank of America Corp., which rose $1.24, or 6.3 percent, to $20.87. Some smaller banks also rose, including Fifth Third Bank Corp., which advanced 67 cents, or 6.9 percent, to $10.40. Not all financials enjoyed a bounce, however. Morgan Stanley Inc. fell $2.77, or 22 percent, to $9.68 as investors worried that even with a major investment from Japan's Mitsubishi UFJ Financial Group the company was still facing troubles. Meanwhile, Goldman Sachs Group Inc. fell $12.55, or 12 percent, to $88.80. Citigroup Inc. said late Thursday it was suspending its bid to acquire Wachovia Corp., which will be acquired by Wells Fargo & Co. Citigroup rose $1.18, or 9.1 percent, to $14.11, while Wells Fargo fell $1.06, or 3.9 percent, to $28.31. Wachovia surged $1.55, or 43 percent, to $5.15. Financials were most prominent among the stocks that rose in the S&P 500, though technology stocks generally advanced. Apple Inc. rose $8.06, or 9.1 percent, to $96.80, while eBay Inc. rose 77 cents, or 4.8 percent, to $16.73. Investors appeared unfazed by final results arriving in afternoon trading from an auction Friday that set the price of debt issued by now bankrupt Lehman Brothers Holdings Inc. at 8.625 cents on the dollar, down from a preliminary estimate of 9.75 cents.